A Leeds consultant at St James’s University Hospital is one of the first surgeons in the world to perform a 3mm laparoscopic cholecystectomy, using Surgical Innovations’ (SI) unique 3mm clip applier. Consultant Giles Toogood used SI’s brand new LAP3 procedure kit to remove 36 year-old Felicia Chikukwa’s gallbladder following complaints of severe pain in her abdomen. The fact that he was able to use instruments that are only 3mm in diameter to carry out the operation meant Felicia’s scars were much smaller than traditional laparoscopic surgery. It also reduced the amount of post-operative pain Felicia felt, offered less risk of port-side hernias and provided a 50 per cent reduction in internal tissue damage. 3mm surgery is less invasive than traditional laparoscopy as it enables smaller incisions to be made in the abdomen. It also promotes quicker healing and negates the need for port-site closure suturing at the end of the procedure saving the patient the discomfort of stich removal. Widespread adoption of 3mm laparoscopic cholecystectomy surgery is now possible as a consequence of SI’s introduction of its innovative 3mm clip applier, SpringLoc™, which dispenses Medium/Large clips down a 3mm shaft, and an integral part of the LAP3 kit. Speaking after the operation, Consultant Giles Toogood, said: “Surgeons have gone from 12mm, to 10mm, 5mm and now 3mm it is a natural evolution to get smaller. The bottom line has to be improved patient outcomes and we believe that 3mm surgery can offer a reduction in post-operative pain and quicker recovery times which is essential. “Compared to 5mm, 3mm surgery is like a scratch on the skin – there is a very noticeable difference in the sizes of post-operative scars. Felicia Chikukwa, from New Forest Village, Leeds, said: “As a mum of two young boys, my main concern was how I would manage post- operative pain and continue to care for my family at the same time. “I was also worried about the length of recovery time and scarring. “I am delighted to be one of the first patients in the world to benefit from the use of such small instruments and a faster healing time. Graham Bowland, CEO of Surgical Innovations, said: “We truly believe there is a trend towards 3mm laparoscopic surgery. “Surgical Innovations 3mm instruments allow surgeons like Mr Toogood to be at the forefront of this move towards what we call ‘Ultra Minimally Invasive Surgery’. 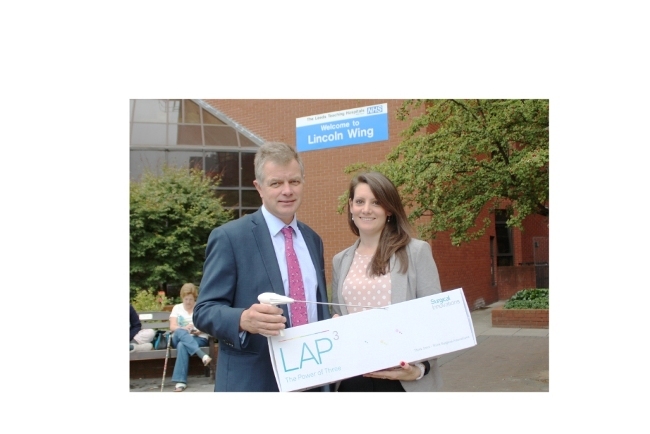 The LAP3 kits are being launched in the UK on the 18 September at the Association of Upper Gastrointestinal Surgeons of Great Britain and Ireland (AUGIS).